As you know, there is an affiliate program which is working currently on our platform. 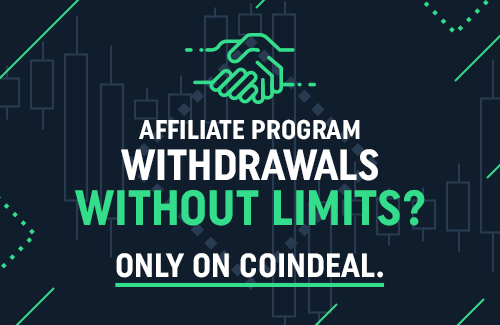 We will send rewards from affiliate program to every participating user of CoinDeal wallet at 1st of August, and it will be automatically sent to you at 1st of every month. Also, we decided to remove every limit, so you will receive every part of crypto (even the smallest amount) you should receive from our affiliate program, without any restrictions. So, from now on, you will receive payouts from our affiliate program starting at 1st of the August and next 1st of every month. Your friend who registered and started trading with your affiliation link - is trading on LTC/BTC market. Fee during selling LTC and buying BTC is 0.123456789 BTC. You, as a user who invited a trader, will receive 0.0617283945 BTC during promotion fee 50%, and 0.0246913578 BTC during normal fee. All this amount will be sent to your wallet. We hope that your accounts balance will be much bigger!